Visiting a place for the first time doesn't always go as smoothly as planned. Even if you Googled a website or Wikipedia page beforehand, it doesn't really compare to getting a genuine opinion or review from a friend or other individual who's already visited. These days, seeing what other people have to say about restaurants, tourist attractions, bars, hotels and more is as easy as pulling out your smartphone. There are all sorts of different apps that can use your device's GPS technology to find where you are and immediately give you tips, reviews, and recommendations about the place you're at from real people who've already been there before. Facebook has a feature in its iOS app called Place Tips. This is not a separate app, so all you need is your regular Facebook app installed. When you check your News Feed, you may see tips and recommendations about nearby locations listed at the top. Tapping on on a tip will show you photos and posts from friends who may have visited already in addition to other relevant information -- like popular features, upcoming events, and reviews from previous visitors. Years ago, Foursquare was the coolest location-based app that people used to check-in to places and share with their friends. Now, the Foursquare app is intended for location discovery (while its Swarm app is used for social sharing). Foursquare lets you select a number of interests or "tastes" so that it can provide better location recommendations to you. You can even select a particular taste and see tips left from other users who visited nearby places. If you're looking for lots of reviews from real people about specific places, Yelp is a must-have app. 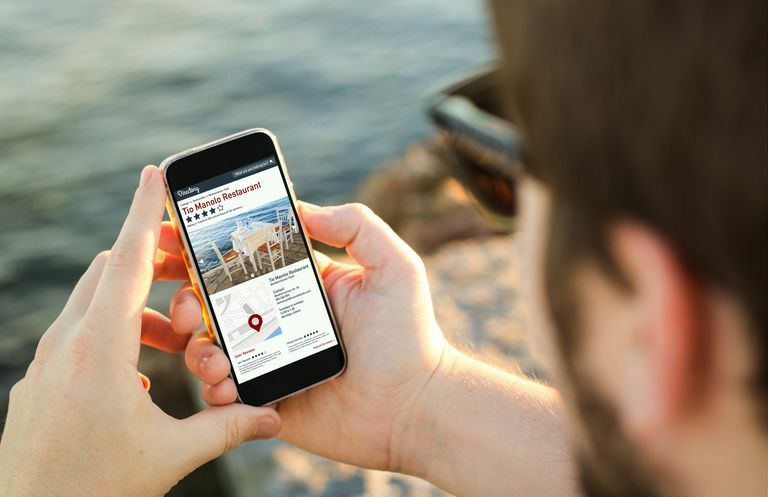 Not only can you get directions to a place, see what's on their menu if it's a restaurant, browse photos and check-in there yourself -- you'll also have access to thousands and thousands of star ratings and reviews. The most helpful highlighted user reviews are listed first, so you can always be sure to see the best information first without needing to sift through all of them. Gogobot is the ultimate travel app to have on your phone. If you're traveling to a brand new place as a trip or vacation, Gogobot can give you all sorts of details about hotels, rentals, restaurants and things to do while you're there. This is another app that learns about your interests and delivers personalized recommendations. Everything also has a five-star rating system, so you always see the average rating of a place, with the option to expand it and read individual user reviews. Sometimes, ratings and reviews come in handy for places that serve food and drinks. Urbanspoon is all about dining experiences and nothing else. Nobody likes bad food or terrible service, so using the app to find out more about restaurants, bars and other places from people who've dined there already can help you make better choices when deciding where to grab a meal or a drink. You'll be able to see menu items along with photos, and you can see what's popular nearby or adjust your location to places you may be traveling towards.